April Coppini was born and raised in a wooded suburb of Rochester, New York. She attended the University of the Arts in Philadelphia in 1990 and Alfred University, School of the Arts from 1991-1994. 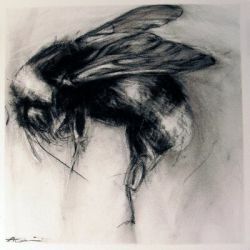 She received her BFA from Alfred in printmaking and drawing and moved to Portland, Oregon in 1995. April works at her home studio in NE Portland where she lives with her family and finds inspiration from her three children, their eleven chickens, two cats, and (the best ever) dog, Duke. When she is not working, she spends time watching her children, fussing over the chickens, computer stalking other artists and running with Duke. In the past eight years, I’ve gone from thinking that there are two kinds of bees (Honeybee and Bumble) to being completely awe-filled and astonished by the fact that there are somewhere around FOUR THOUSAND bee species on our continent alone. The intricate web of creatures and growing things that makes up the support system that carries us and the rest of the planet through our daily lives are far more complex and interconnected than we could ever grasp. It is mind-blowing to me; as is how careless and ignorant we can be as a species. Art is my way of trying to wrap my brain around all this, to call attention to what I can, and to keep myself in a state of humble learning about it all. Drawing, especially, for me, is sort of a meditative act of reverence; noticing not just the form and details of something, but the way it is; how it moves in space, how it breathes, how the air is around it. Charcoal on paper gives me simple, immediate access to this work, and the high contrast of black and white strikes a chord in me, especially in moments of desperation; something about necessity and survival. In Werner Herzog’s film “Cave of Forgotten Dreams” about the oldest found cave paintings (Chauvet Cave in France), one of the researchers theorized that the paintings (many of which are in charcoal) were done in a kind of ritual of spiritual awe and appreciation of the animals around them that both gave them life and took it. I love that idea; because I think it’s this kind of bringing images of the creatures around us inside that both helps us appreciate and understand them and our own place in the world.